The Top Fedoskino artist Kozlov Sergey is fond of painting architecture of old Russian towns. He has already created a series of works drawn on this theme, and here is the Kremlin of the town where he was born! Town of Dmitrov is located about 50 kilometers to the North from Moscow, you will pass the village of Fedoskino on the half way to it. Town of Dmitrov was founded by Yury Dolgorukiy in 1154 deep in the woods at the site where his son Vsevolod was born. Its name is explained by the fact that Vsevolod's patron saint was St. Demetrius. In the 13th century, the settlement marked a point where the borders of the Grand Duchy of Moscow, Tver, and Pereslavl-Zalessky converged. The settlement itself belonged to the princes of Galich-Mersky, located much to the north, until 1364, when it was incorporated into the Grand Duchy of Moscow. Both Dmitry Donskoy and his grandson Vasily II granted Dmitrov as an appanage to their younger sons, so Dmitrov was the capital of a tiny principality. In 1374, it was given town rights. The reign of Ivan III's son Yury Ivanovich (1503-1533) inaugurated the golden age of Dmitrov. 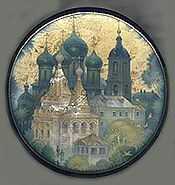 It is during his reign that the black-domed Assumption Cathedral in the kremlin and a smaller monastery cathedral of Sts. Boris and Gleb were built. Thereafter, the town passed to Yury's brother, Andrey of Staritsa. In 1569, it was seized from Vladimir of Staritsa, added to the Oprichnina and consequently went into a decline. The town suffered further damage during the Time of Troubles, when it was ransacked by the Poles. The artist masterfully painted the 18th century architecture. The skies are painted in the the golden paint, looks rich and shiny! The box have several pieces of mother-of-pearl, that are shines through the roofs and high parts of the churches (before the domes). The composition is framed with the golden band. Another gold band is passed across the base of the box. The box's exterior is covered with dark blue paint. The box's interior is traditionally red . The box is constructed from paper-mache. The lid is hinged to the top of the scene. Signed with the artist's name, the village of Fedoskino and the year of 2018.